It’s almost impossible to express just how eye-opening Lucio Fulci’s ZOMBIE (1979) was to me as a budding horror fan when I discovered it during a gig as a night watchman just after high-school. From sunset til dawn for a week, I spent the majority of my time on the clock catching up on my watchlist, while casting occasional glances at the security feed. Suffice it to say, my already less-than-watchful eyes ceased to do their job entirely when I began streaming ZOMBIE in the wee hours one morning. It wasn’t until the soft light of dawn was creeping in, and I was relieved from my post that I could break them away from this world of artful gore, post-synching, and zombie/shark battles. With Fabio Frizzi’s distinctive score still thrumming in my head, I knew I was hooked. I just had to know where the hell this film had come from, and my initial exposure to it lead to a very personal obsession with both Lucio Fulci and Italian genre cinema that persists to this day. Returning to ZOMBIE over the years, my affection for it hasn’t waned one iota. Yes, Fulci’s THE BEYOND is considered by many to be the apex of his craft, and DON’T TORTURE A DUCKLING is a giallo that all but eclipses anything else in that subgenre, but ZOMBIE is terror, itself: a slow, repulsive, masterfully-staged descent into hell that I frequently associate with the elegant simplicity of Tobe Hooper’s THE TEXAS CHAIN SAW MASSACRE. When a scientist’s boat turns up in New York harbor minus its crew, his daughter, Anne (Tisa Farrow) enlists the help of a journalist named Peter (Ian McCulloch) to locate him at his research station on the isolated Caribbean island of Matul. En route, they befriend shaggy boatman, Brian (Al Cliver) and his gal Friday, Susan (Auretta Gay) who agree to ferry them to the island despite its cursed reputation. When they finally make landfall, they meet Dr. David Menard (Richard Johnson) who informs them about Anne’s father’s brutal last days and the voodoo rites he’s been researching which somehow seem to return the dead to life. Adapted from a screenplay by Dardano Sachetti–a frequent collaborator throughout Fulci’s career–ZOMBIE was conceived as an unofficial sequel to George A. Romero’s DAWN OF THE DEAD (1978), which was titled ZOMBI in Italy and had been a major hit. Known as ZOMBI 2 in its home country, Producer Fabrizio De Angelis greenlit the project and hired Fulci based on his handling of violence in his gialli. Though a commercial success in the states (nipping at the heels of such respectable top ten box-office darlings as THE EMPIRE STRIKES BACK and THE BLUES BROTHERS) ZOMBIE was, unsurprisingly, widely dismissed by critics upon release due to its perception as a piece of gutter exploitation hucksterism. It is that, but ZOMBIE has very little of Romero’s films in its DNA, as Sachetti chose instead to look back to the genre’s roots for inspiration. While Romero recreated the zombie flick anew with his urban-set, subtext-heavy ruminations on contemporary socio-political issues, Sachetti’s script had more in common with WHITE ZOMBIE (1932), VOODOO ISLAND (1957), and I WALKED WITH A ZOMBIE (1943)–films about white interlopers contending with malefic supernatural forces in isolated tropical settings. Also, unlike most contemporary zombie cinema, which sought a concise, often scientific, reason for the re-animation of corpses, ZOMBIE and the films that influenced it don’t offer up any easy explanation. The incomprehensible nature of ZOMBIE is what makes it effective, and foreshadows Fulci’s later reality-bending, Lovecraft-inspired, “Gates of Hell” trilogy. Though some may find Fulci’s first official horror effort somewhat slow, there’s no denying that this classically-styled tale of the walking dead conjures up a sense of languid dread. Fulci recreates the pacing of the films Sachetti was inspired by, taking his time building to the fiery, church-bound siege of its finale and relying more upon gruesome visual splendor than narrative to create this effect. This splendor is one of putrefaction and rot, with the risen dead boasting an almost tactile nastiness that’s unmatched by any other zombie flick. You can practically smell them as they rise from the earth in grandiloquent slow motion, giving the viewer ample time to take in this assaultive visual feast of writhing bloodworms and moldering flesh. As mentioned before, the pacing is strange, dreamlike, almost hallucinatory. It unsettles, but also serves the practical purpose of showing off the effects work in a manner that few horror directors would dare, especially in those days when editing was so vital in hiding the rough edges. There is, of course, also something sadistic in the pacing of these set-pieces, specifically the infamous moment when Dr. Menard’s wife, Paola (Olga Karlatos) has her tender cornea pierced by a piece of splintered wood in agonizingly unhurried detail. This slow and steady method has the cumulative effect of creating what feels like an inescapable “waking nightmare”—an apt, two-word summation of any of Fulci’s masterworks, a group of films which, arguably, ZOMBIE is the best of. It’s Blue Underground’s second go-round with ZOMBIE, presenting a new 4K restoration of the film from the original camera negative. This is a seminal presentation of a film that has never looked particularly “good” in even the best of formats. The visual detail is breathtaking, especially for longtime fans who never expected the movie to shine up like this. The image is spectacularly clean and balanced, with almost zero damage. Though grain levels can appear a bit uneven, this is the best ZOMBIE is likely to look. On the special features front, Blue Underground has included everything from their previous release of the film and some worthy new stuff as well, including a commentary by Troy Howarth (who was also recently featured on Scorpion/Ronin Flix’s restoration of MURDER ROCK) and an interview with Stephen Thrower, both authors/Fulci experts, who offer invaluable context and insight into the film and its legacy. They compliment a bevy of trailers, interviews and still galleries that many have already seen, but are absolutely worth revisiting. If the exhaustive features and sterling restoration aren’t enough to convince you to double-dip, Blue Underground has sweetened the deal by including a new soundtrack CD, a booklet with a new essay by Thrower, and your choice of three spectacular lenticular slipcovers. Though made to ride the coattails of a hit property like so many Italian films of the time, Lucio Fulci’s ZOMBIE is one of the best displays of the director’s ability to inject his singular stylistic panache into a derivative genre effort. Though not without its ridiculous, grind house elements, the thump-thump-thump of Frizzi’s main theme always brings the viewer back to the pure, unearthly terror of it all. 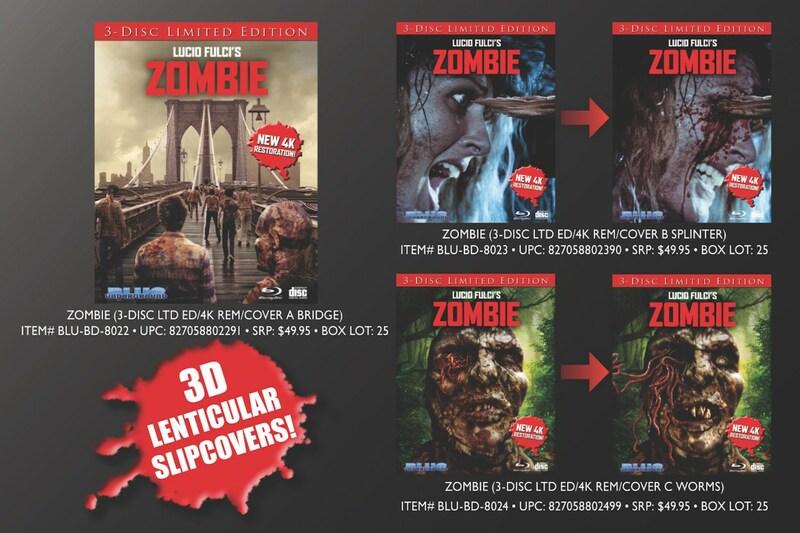 Taking inspiration from the earliest days of zombie cinema and adding a rich coating of grime, decay, and gore, ZOMBIE is a spaghetti splatter cornerstone that looks better than ever in Blue Underground’s new 4K restoration—one of the few absolute “must-own” releases for horror fans this year.